Israel’s ambassador to the United States is in Iowa today and he was invited to speak in the Iowa legislature this morning. Ambassador Ron Dermer praised state officials for passing a law in 2016 that has banned any direct state investment in companies that boycott Israel. “Thank you, senators, for standing up to a new anti-antisemitism by rejecting a BDS movement that discriminates against the world’s only Jewish state,” Dermer said. 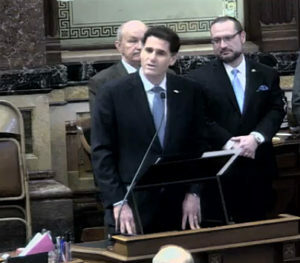 Dermer is the first Israeli Ambassador to the U.S. to visit Iowa. He referred to the Iowa Caucuses, the kick-off event in the presidential nominating process. Dermer, a Florida native, moved to Israel in 1996. He was a senior advisor to Israel’s prime minister before becoming Ambassador to the United States in 2013. Dermer said the U.S. and Israel have “shared values” that will bring the two countries closer together in the years to come. “In a Middle East where women are often treated like property, where ancient Christian communities and other minority populations have been decimated, where gays are hanged from cranes in town squares — Israel stands out as a beacon of humanity and decency,” Dermer said. Dermer noted Israel is one-seventh the size of Iowa, with about nine million citizens and he warned the security threats the two countries will face for the foreseeable future will come from the Middle East.